At the time of writing I have a complete draft thesis of five chapters plus introduction and conclusion. Once I’m happy with the introduction I intend on going back over three of my main chapters that require particular attention in order to highlight some of the key themes that have come out during the course of my study. I hope to have a full ‘first draft’ by the end of the calendar year. As I write this blog I’m currently in the process of drafting a paper on Bernard Wolfe’s Limbo which I hope to send out to a journal in a few months’ time. I also have a couple of pieces waiting for various people for feedback pending possible publication, and have a few more I’m hoping to send out. On top of this I’ve also been invited to contribute two chapters to a book on 1960s science fiction, which I hope to start in June so I have them both done in good time for the December deadline. I’ve attended several conferences already this year, and still have a few more planned in my diary. I’ll be presenting a paper at this year’s CRSF conference in Liverpool in June, and then at After Fantastika here at Lancaster the following week (they will be different papers). I also helped organise and run the Graduate College’s Postgraduate Research Conference at the Management School on 12th May, and appeared on the judging panel to award prizes to the best papers. I haven’t got any more conferences planned just yet, but that’s not to say something won’t come up! I’m still an active member of the TTAC21 research group. It seems strange to think that TTAC21 has been going for over a year now, and I’ve contributed responses to pretty much every blog post the group has published. While many other members of my colleagues seem reticent to want to branch out beyond their own subject area, I can honestly say that TTAC has been one of the most positive things to have come out of my time at Lancaster. Since last term my role in Student Comms here at Lancaster has moved out of Student Based Services and into the Marketing and Communications department. Other than the office relocation, my role hasn’t really changed at all, and I continue to make 33 targeted newsletters per academic year for over 15,000 students here at Lancaster. 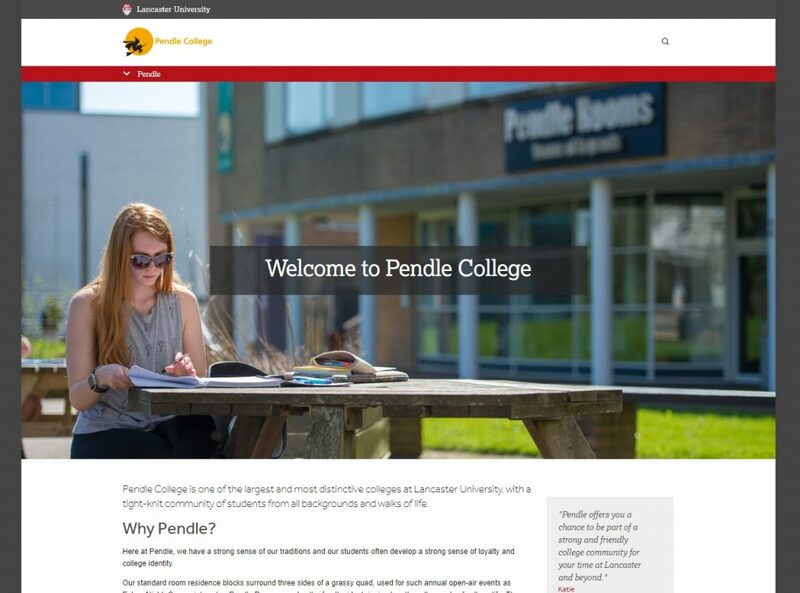 At the time of writing I’m just putting the finishing touches on the new Pendle College website, which we hope to publish before the start of the next academic year. Once this project is complete I will have been responsible for a third of all Lancaster University’s college websites, with the potential for more projects to come. I’m still working for Canterbury Christ Church University (CCCU) IT department, a day a week, to help with IT communications. My main tasks involve updating the internal and external facing web pages, providing analytics reports and responding to various requests from stakeholders. As you can see, I’ve been pretty busy! The next few months don’t look to be getting any easier, but I’m making good progress with my writing, and have found what I like to think is a good work-life balance. I’m really enjoying my time here at Lancaster, and I like the fact I can do my PhD while also putting some of my more technical skills to use on various projects such as the college websites, and my work for CCCU. In the next few months I hope to have started on two book chapters, finished my paper on Limbo and written (and delivered) my two conference presentations in June and July – all of which while continuing to work on my PhD, and continuing my work for Lancaster University, CCCU and the Graduate College. Full steam ahead!